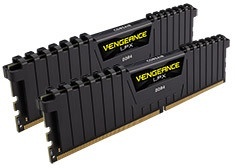 Corsair Vengeance LPX CMK16GX4M2B3200C16 16GB (2x8GB) 3200MHz DDR4 in black, 16-18-18-36, 1.35v, XMP 2.0, unbuffered, 288 Pin, Anodised Aluminium heatspreader. Corsair Vengeance LPX memory is built for overclocking with an efficient heat spreader and eight-layered PCB work together to show off your system while providing superior temperature management and effective cooling. All Corsair memory is individually screened for quality control and maximum performance and are backed by a Limited Lifetime Corsair Warranty.